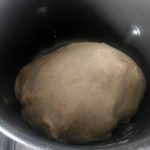 I am making bread for a couple of years but for a quite long time I was not that happy about the recipe: sometimes, the taste was not what I was expected, some other time, the bread didn’t growth that much which led to really compact bread… At that time, I would say I was quite purist as I wanted to only use flour, water, salt and yeast for my bread… but that was a couple of years ago. 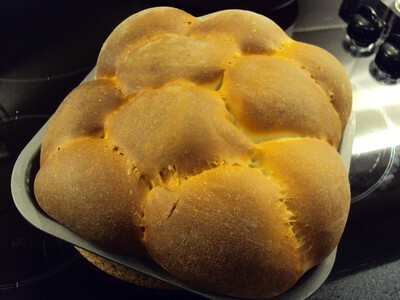 With the New Year, I decided to do an extensive trial of bread in order to crack the recipe which is going to suit me. 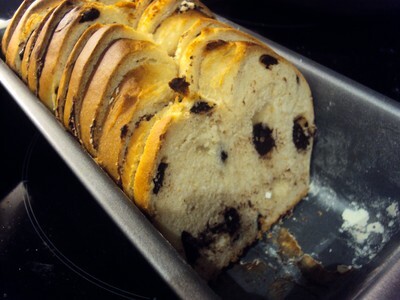 It took a couple of trials and it certainly took some new ingredients such as sugar and butter. Those two last ingredients were the one missing from all my previous experience and I now have no regret to not sticking to the traditional 4 ingredients. 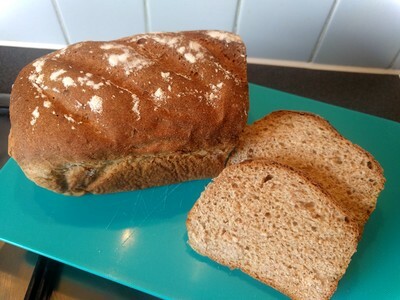 I love those new recipe bread as the bread is really convenient for our consumption (enough for a couple of days), the crumbs are really airy, the taste has the right balance of salt and sugar and no taste at all of the yeast. 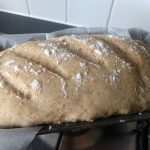 Now, that I have the recipe, there is always homemade bread at home, that smells really good and that is really tasty to eat every day. 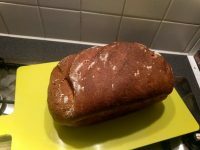 Now, I played with various flour for having new taste, so this week, it is a bread with Rye and Spelt flour, really delicious. Let’s bake it! 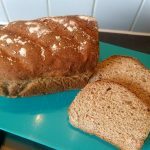 How to do Spelt and Rye flour bread? 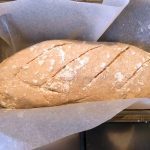 I usually put a baking parchment paper for making sure that removing the bread from the bread tin is easy. Add a ramekin of water in your oven during the preheating, that will allow having a crispier bread, as it will make steam. The ramekin needs to stay in the oven when the bread is in it.